Ammonium Sulfate, (NH4)2SO4, is an inorganic salt which is an important source of nitrogen (N) and sulfur (S) for crop nutrition. It can be used as a directly applied fertilizer as well as a component of NPK blends and compound fertilizers. Its nutrient analysis designation for N, P, K and S is 0-0-21-24S. Intentional synthesis by reacting anhydrous ammonia and sulfuric acid. It is typically supplied in a dry form, either in the form of crystals or as a compacted, granular product. Crystalline ammonium sulfate can vary widely in particle size and shape. Because of the tendency of ammonium sulfate particles to cake in storage and also to degrade and generate dust, conditioning agents such as dust control coatings and anti-caking coatings are widely used at production and shipping points. Such treatments may sometimes also be necessary at downstream storage and transfer locations. 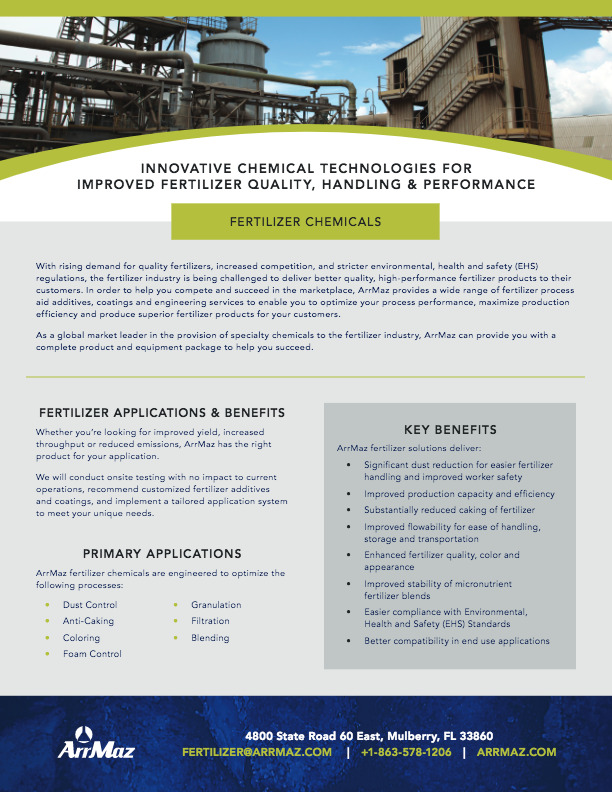 ArrMaz designs and produces coatings in its DUSTROL® and GALORYL® product lines which are specifically developed for the treatment of ammonium sulfate fertilizer and can be customized to address the individual product and process challenges of producers and users.